This paper investigates the role of Soviet-style “active measures” as an element of modern Russian “political warfare.” These techniques were commonly used during the Soviet-era, encompassing a broad range of influence activities, including: covert media placement, forgery, agents of influence, “friendship” societies, front organizations, and more. Today, in Putin’s Russia, these active measures are once again in use, updated for digitally interconnected “global information space.” The paper begins with an introduction to active measures, then discusses their role in Soviet foreign policy and the attempts by the American “Active Measures Working Group” to counter them. The paper then describes how the Soviet active measures playbook has been updated for the modern era, using three case studies as examples. The paper concludes with a discussion on strategy, reproducing a number of recommendations from key publications. The neatest trick of the devil is to persuade you that he does not exist. They began to appear in late February 2014. Equipped with the latest military weapons and gear, stripped of identification and riding unmarked military vehicles, they rapidly seized ground. While the world looked on in confusion, in a few weeks it was over; Crimea belonged to the Little Green Men. Several months later, on a beautiful July afternoon, a shower of composite and aluminum aircraft parts suddenly darkened the blue skies of Eastern Ukraine, raining down upon the sunflower fields near Hrabove. The 298 passengers and crew of Malaysia Airlines Flight 17 were all killed when their Boeing 777 was struck by a Russian-made 9M38 missile, launched by a Buk-M1 anti-aircraft system. At over 18 feet long, the missile was nearly the size of a telephone pole, and traveling three times the speed of sound. Screened by a schizophrenic torrent of state-sponsored propaganda, the Kremlin maintained innocence, distancing Russia from the controversial events and vehemently denying involvement – despite mounting evidence to the contrary. For many Western audiences, their first introduction to modern Russian propaganda was the frenetic spin cycle surrounding these dramatic events. Described as “darkly, nastily brilliant” and “so much more sophisticated than Soviet propaganda,” in the year and a half since Crimea’s illegal referendum on independence, journalistic observation and scholarly analysis of the RT television network (formerly Russia Today) and others have helped raise awareness of the Kremlin’s coordinated manipulation of Russian mass media. Unfortunately, RT and other state-controlled media outlets represent only one facet of a much larger influence campaign – a single tool in a range of understudied activities that constitute a concerning gap in the West’s broader “soft-containment” of Putin’s Russia. In short, the Soviet approach to international relations can perhaps best be described as a form of “political warfare,” with the manipulative and deceptive techniques of active measures playing an essential and important role. The most powerful enemy can be vanquished only by exerting the utmost effort, and by the most thorough, careful, attentive, skillful, and obligatory use of any, even the smallest, rift between the enemies, any conflict of interests among the bourgeoisie of the various countries and among the various groups or types of bourgeoisie within the various countries and also by taking advantage of any, even the smallest, opportunity of winning a mass ally, even though this ally is temporary, vacillating, unstable, unreliable, and conditional. The Russian Federation is currently waging “the most amazing information warfare blitzkrieg … in the history of information warfare,” pursuing a revanchist foreign policy considered by senior diplomatic and military leaders to be a tremendous security threat for both Europe and America. While many in the West are by now familiar with Russia’s infamous RT network, its state-sponsored media outlets are only the tip of the iceberg – the “white propaganda” component of a much broader system of influence activities designed to shape the global information space. Described by Major General Oleg Kalugin, the KGB’s highest ranking defector, as “the heart and soul of Soviet intelligence,” these “active measures were well integrated into Soviet policy and involved virtually every element of the Soviet party and state structure, not only the KGB.”  As a major component of Soviet foreign policy, these tactics were incredibly well resourced. According to experts, the “Soviet active measures apparatus dwarfed, by a factor of perhaps 20 or 30 to one, the US governmental apparatus set up to analyze and counter its activities.”  At their peak, it is estimated that the Soviet active measures campaign employed up to 15,000 people – more than the number of diplomats serving in the post-9/11 US Department of State. I would describe it as the heart and soul of the Soviet intelligence – was subversion. Not intelligence collection, but subversion: active measures to weaken the West, to drive wedges in the Western community alliances of all sorts, particularly NATO, to sow discord among allies, to weaken the United States in the eyes of the people of Europe, Asia, Africa, Latin America, and thus to prepare ground in case the war really occurs. To make America more vulnerable to the anger and distrust of other peoples. Even at the height of the Cold War, despite their massive scale, the use of these programs by the Soviet Union was not well understood, and today, broadly addressed under the ambiguous labels of “hybrid warfare” and “malign influence,” these techniques are even less understood, and their use largely forgotten – relics of the Cold War. Unfortunately, it is becoming clear that Soviet-era active measures are alive and flourishing in Putin’s Russia. Enabled by technology and adapted for a globalized world, their modern incarnations are much more sinister, with far greater range and speed – and, through the Internet, able to influence popular opinion on a scale never before possible. Through the European Reassurance Initiative and Operation Atlantic Resolve, US and NATO allies are working to deter Russian military aggression along the Alliance’s flanks. Sector-based and individually-targeted economic sanctions have been imposed on Russia by the US and the EU. Western awareness of Russian propaganda is steadily growing, and steps are slowly being taken on both sides of the Atlantic to reduce the effectiveness and reach of the campaign. Despite efforts to mitigate Russia’s military threat on one end of the spectrum and a white propaganda campaign on the other, publicly at least, the “gray area” in the middle remains largely unaddressed. This is key terrain – the battleground for active measure campaigns. While the “means” have been updated for today’s environment, strikingly close parallels may be drawn between the “ends” and “ways” of the Soviet active measures playbook and the “malign influence” of Putin’s Russia. A profound shift from containment and détente, the Reagan Doctrine, as the strategy outlined in NSDD 75 became known, took a much more aggressive stance toward the Soviet Union. Designed to “accelerate the demise of the Soviet Union,” and “roll back” Soviet influence throughout the world, NSDD 75 offered clear strategic guidance and resulted in the broad implementation of new initiatives across all instruments of national power. Easily overlooked amid this transformation and lost in the high-stakes drama of the Reagan years was the formation of a small “part-time interagency committee” known as the Active Measures Working Group (AMWG). Established in the summer of 1981 and producing a final report in 1992, the group operated for eleven years at the height of the Cold War, with the collapse of the Soviet Union ultimately signaling its end. Originally headed by Deputy Assistant Secretary of State Dennis Kux and nested under the US State Department’s Intelligence and Research Bureau, the group included stakeholders from numerous agencies, including the Department of State (DOS), Department of Defense (DOD), Central Intelligence Agency (CIA), Defense Intelligence Agency (DIA), Federal Bureau of Investigation (FBI), Department of Justice (DOJ), Arms Control and Disarmament Agency (ACDA – later folded into State), and the (now defunct) US Information Agency (USIA). The group successfully established and executed US policy on responding to Soviet disinformation. It exposed some Soviet covert operations and raised the political cost of others by sensitizing foreign and domestic audiences to how they were being duped. The group’s work encouraged allies and made the Soviet Union pay a price for disinformation that reverberated all the way to the top of the Soviet political apparatus. It became the US Government’s body of expertise on disinformation and was highly regarded in both Congress and the executive branch. One way of looking at the impact of these activities… is to think of drops of water falling on a stone: five minutes, ten minutes, fifteen minutes, one hour, one day, nothing happens, but five years, ten years, fifteen years – you’ve worn a hole in the stone. KGB influence activities did include setting up and funding front groups, covert broadcasting, media manipulation, disinformation and forgeries, and buying agents of influence. However, this understanding of active measures is too narrow. Soviet active measures went beyond overt and covert operations to manipulate perceptions and into the realms of incitement, assassination, and even terrorism. Soviet leaders made no major distinction between overt propaganda and covert action or between diplomacy and political violence. In practice, they all were tightly controlled by the Politburo and Secretariat of the Communist Party of the Soviet Union, which approved the major themes of active measures operations. The concept of active measures, then, offered by the State Department’s AMWG provides the best basis for an unclassified, open source examination of the issue, and a starting point for efforts to analyze and expose Russian active measures in the current operating environment. [Consider] the whole spectrum of Soviet foreign policy endeavors through the optic of “white,” “gray,” and “black” operations. Normal diplomatic, trade, aid, and informational efforts can be considered “white” or overt activities. “Gray” activities are those involving communist fronts, foreign communist parties, “clandestine” radio stations, or well-known media outlets for disinformation. While not officially acknowledged to be Soviet sponsored, semi-overt “gray” activities are widely known as under Soviet direction and control. In contrast, “black” activities involve genuinely clandestine operations: the use of agents of influence, spreading false rumors, duping politicians and journalists, and disseminating forgeries and fake documents. Active measures fall under either the “gray” or the “black” rubric, although the line ... is often blurred. 1) Center gives strategic go-ahead for a disinformation campaign. 2) Ideas would be generated by residency officers assigned to read local press, books, and magazines for material that could be used for disinformation purposes. 3) Center would evaluate the ideas. 4) Still at the Center, preparation involved disinformation specialists writing in their native language, approvals by managers, and translation. 5) Targeting followed. The Center typically sought to launch a story outside the Soviet bloc-controlled press to conceal Moscow’s hand. This was done frequently through anonymous letters and newspaper articles in the Third World. 6) Once published abroad, the Soviet media might pick up and further propagate the item by referring to its non-Soviet source. The first category includes operations initiated and designed within KGB ranks and usually employs such traditional disinformation techniques as forgeries or agents of influence. The KGB conducts hundreds of these categories every year even though their impact is rather limited. The second type was the result of a strategic decision at the top of the Soviet active measures pyramid and directly approved by the Politburo. Campaigns were usually planned to last several years and encompassed many elements of the Soviet state, including the International Information Department (IID), which directed official press organs, such as TASS, Novosti, and Radio Moscow; and the International Department (ID), responsible for liaison with foreign communist parties, international communist front organizations, and clandestine radios. The KGB, ID, and IID would cooperate closely in executing a particular campaign with the means available to each – the KGB’s Service A, responsible for forgeries and spreading rumors (“black propaganda”), the IID’s press organs for official stories (“white propaganda”), the ID for clandestine radio broadcasts and the use of international front organizations (“gray propaganda”). A growing body of evidence suggests that a very similar system of top-down control over Russian disinformation efforts is still in use by the Kremlin today, with journalist Peter Pomerantsev and a number of other former Russian media insiders describing their personal experiences from within the system. Russia’s disinformation campaigns, like the Soviet Union’s, appear to be coordinated and controlled at the highest levels of Kremlin leadership. Both the hard-line former communist forces and the Russian Government are engaged in active measures and disinformation operations, in the quest to achieve their political goals. Both groups should be expected to continue to pursue such operations vigorously. Until and unless a truly democratic regime that fully embraces Western ideals of truth, honesty, openness, and mutual advantage emerges in Russia, those in power or contending for power there will, most likely, find it to their advantage to continue active measures and disinformation operations. The USIA published a final report on active measures in 1992, but not because Kremlin influence campaigns had ceased to exist. The report, titled “Soviet Active Measures in the Post-Cold War Era 1988–1991,” highlights a number of interesting phenomena that took place at the twilight of the USSR. Following the Cold War’s end, while the use of “crude, anti-American disinformation” waned, the KGB’s active measures apparatus refocused its efforts, ratcheting up attacks on a range of new targets. As the collapse of the Soviet Union neared, new influence campaigns focused on ensuring the survival of the Soviet status quo and preserving existing power structures. In the wake of the Cold War and with the “Red Menace” defeated, Western attention would largely shift away from the former Soviet Union – now free to focus elsewhere. The West began to cut military spending, slashing programs and shedding experts and infrastructure deemed obsolete, with the savings earmarked for new domestic priorities – the so-called Peace Dividend. With the threat of nuclear war averted, in the 90s a new range of conflicts and threats emerged to capture America’s attention: Saddam Hussein’s 1990 invasion of Kuwait and the subsequent Operations Desert Storm and Desert Shield, a decade of conflict and genocide in the former Yugoslavia, and the ascendancy of Al-Qaeda and the “new” threat of terrorism, as witnessed in the 1993 World Trade Center bombing, the 1995 Oklahoma City bombing, the 1996 Centennial Park bombing, the 1996 Khobar towers bombing, and the 1998 bombings of US Embassies in Tanzania and Nairobi. Meanwhile, with the KGB and its tools of “political warfare” seemingly consigned to the history books, a new, capitalist Russia was emerging from the ashes of the Soviet Union, with powerful oligarchs siphoning away state resources and creating a system of “kleptocracy,” birthing a “mafia state” that would lead Russia into the era of Putinism. Growing up in post-war Leningrad and “influenced by films and books,” young Putin became enamored with the world of espionage, setting his sights on a career with the KGB. After completing university in 1975, he officially joined its ranks, launching a 16-year career and attaining the rank of lieutenant colonel before ostensibly leaving the service in 1991. After the KGB, he entered politics, serving as Deputy Mayor of St. Petersburg until 1996. In July 1998, he returned to the security services, where he was appointed Director of the Federal Security Service (FSB) by President Boris Yeltsin – putting him in charge of the KGB’s closest post-Soviet successor. For “the man without a face” (to borrow from journalist Masha Gessen), an accurate, open source account of his time with the KGB may never come to light, and the truth of Putin’s past will likely remain within the realm of speculation. What seems clear, however, is that he served with the KGB’s First Chief Directorate (responsible for foreign intelligence) at the height of the Cold War, during a period that overlapped with the existence of the US State Department’s AMWG. As an officer in the Soviet-era First Chief Directorate, Putin would have been “expected to spend 25 percent of his time conceiving and implementing [active measures].”  He would have first learned to wield these skills in 1975 during initial training and indoctrination at KGB School #1, and they would have been reinforced in Moscow in 1984 during his studies at the KGB’s elite Andropov Red Banner Institute. After serving 16 years with the KGB, and later as head of the FSB, there can be no doubt that Putin is well-trained in the use of active measures as a foreign policy tool – as were all KGB officers of his era. Furthermore, Putin has now been at the top of the Russian Federation for more than 15 years, in 2008 flip-flopping with Dmitry Medvedev for a brief stint as prime minister before returning to the presidency through a slick interpretation of the Russian constitution. After Medvedev’s 2008 extension of presidential term limits to six years, even without further constitutional manipulation, Putin could conceivably remain president of the Russian Federation until 2024 – outlasting Barack Obama and possibly the next two US presidents. With the likelihood of Putin’s continued reign combined with the potential longevity of his vast siloviki network (which will likely far outlive the Putin era), it seems certain that active measures will continue to play a key role in Russian foreign policy well into the foreseeable future. With the hopeful “reset years” now a distant memory, the West must recognize the important role of active measures in Russian foreign policy, taking immediate steps to raise awareness and blunt the effectiveness of these “dirty tricks” in the modern era. Following the dissolution of the AMWG, concrete, verifiable evidence of Russian active measures becomes much harder to expose, and the extent of their use in the 90s remains largely unknown. Reports of their use began to increase, however, after Putin came to office in 1999. More than seven years after the Czech report, with the lessons of Crimea, Eastern Ukraine, and flight MH17 fresh in the global consciousness, it appears that the forecasts made in the AMWG’s final 1992 report have also been confirmed. Today, it seems certain that the Kremlin’s use of active measures in foreign policy did not end with the collapse of the Soviet Union. The use of active measures in modern Russian political warfare is merely the continuation of decades-old Soviet policy, itself a reflection of Imperial Russian methods. In the 21st century, Russia has simply recycled and updated these age-old subversion techniques for use in a digitally interconnected and globalized world – the single world information area described by Soviet thinkers more than 25 years ago. Although the “ends” and “ways” of Putin’s active measures may be broadly analogous to those of the Soviet Era, many of the “means” have been updated for the contemporary environment. In some cases, old methods have been completely supplanted: gone are the typewriters and letter writing campaigns, replaced by view counts, retweets, and “troll factories.” In other cases, old techniques are still effective, and front groups, friendship societies, and agents of influence still have their place today. The ‘black’ (KGB), ‘gray’ (Christian Peace Conference) [a Soviet front group], and ‘white’ (Novosti Press Agency) elements of the Soviet active measures apparatus worked together, weaving a seamless web that first planted and then spread the messages of Soviet active measures specialists, while obscuring their role in orchestrating this campaign from start to finish. Our KGB staff, using new typewriters and wearing gloves so as not to leave fingerprints, typed up hundreds of anonymous hate letters and sent them to dozens of African missions. The letters, purportedly from white supremacists as well as average Americans, were filled with virulent racist diatribes. The African diplomats publicized some of the letters as examples of the racism still rampant in America, and members of the American and foreign press corps quoted from them. In 1983, the Patriot, a pro-Soviet Indian paper that often published pieces provided by KGB agents, released a story claiming that the US military created the AIDS virus and released it as a weapon. For a couple of years, the story appeared in minor publications that were mostly KGB controlled or sympathetic to the Soviets. After this incubation period, the slander was picked up in 1985 by the official Soviet cultural weekly newspaper, the Literaturnaya Gazeta. After that, the story began to spread rapidly. In 1987 alone, it appeared over 40 times in the Soviet-controlled press and was reprinted or rebroadcast in over 80 countries in 30 languages. The AIDS virus was terrifying and not well understood at the time, so this piece of Soviet disinformation was especially damaging to the US image. During the Cold War, one of the most widely practiced Soviet active measure techniques was the manipulation of global media through planted stories. Mainly targeting third-world audiences, the KGB followed a methodology that could be summarized as plant, incubate, and propagate. As described in Studies in Intelligence, false stories were first developed by KGB officers as part of a larger disinformation campaign, and then planted in an easily manipulated media environment – usually in the third world. The story would then be picked up by local news outlets and allowed to incubate. After some time, and depending on a story’s “stickiness,” when it had gained enough traction in smaller markets, larger Soviet press outlets would pick it up and propagate it to a wider audience. While these media manipulation efforts were usually easy for Western audiences to recognize and dismiss, sometimes even major Western outlets were duped into propagating the stories. Even if Western outlets never picked up the story, the seeds of doubt had been sown and, often, their rumors and conspiracy theories made their way back to the West and into public consciousness. In essence, with its Cold War media manipulation efforts, the KGB was “going viral” with its disinformation long before the Internet age. As the now-famous meme goes, “on the Internet, no one knows you’re a dog,” and today it is far easier for Russian disinformation to go viral – without a legion of typewriters and a ream of stamps. Plant, incubate, propagate has been replaced by tweet, retweet, repeat. According to former troll farm owner Platon Mamatov, also profiled in the article, there are “scores of operations like his around the country, working for government authorities at every level.”  At “The Agency” in St. Petersburg, Savchuck was just one of reportedly 400 employees. The true scope of these relatively new trolling operations is unknown, and critically understudied. It would seem, though, that the troll farms accomplish a number of subversive objectives and are directly descended from several classic active measure techniques. Agents of influence are foreigners who have been recruited by the KGB in order to be used to influence the opinions of foreign publics and governments. Agents of influence are extremely useful because they are perceived as loyal patriots of their respective countries who are simply expressing their own personal opinions, not scripts written by the KGB... The covert influence campaigns that they wage in public and private are not only the most difficult type of active measures operation to identify, but also potentially the most potent if the agent of influence is a senior government official or a respected public figure. First, their efforts to pollute the global information space “have made it impossible for the normal Internet user to separate truth from fiction,” shaping the environment for other Russian influence campaigns and messaging. In addition, “waves of trolls and bots regularly promote pro-Putin hashtags” and stories, propagating the Kremlin’s message with a magnitude that was impossible before the Internet and social media age. While examples of social media “weaponization” are becoming increasingly common, a 2014 incident demonstrates how the Kremlin’s hashtag propagation efforts can be amplified with the help of an American celebrity – a useful agent of influence perhaps blindly promoting the Kremlin’s propaganda. Alexander Ovechkin is a renowned and immensely popular hockey player in America’s National Hockey League (NHL). A Moscow native, he played a number of years for Dynamo Moscow and has been a member of the Russian National team on multiple occasions, both at World Championship events and during the Olympics. In 2004 he was the NHL’s number one draft pick, signed by the Washington Capitals and entering the league during the 2005-2006 season. Two years later, he signed the highest paying contract in NHL history, worth $124 million over 13 years. For his achievements on the ice, he was named rookie of the year in 2006, and Most Valuable Player in 2008, 2009, and again in 2013. He currently has 365,000 Instagram followers, and more than 1.42 million on Twitter. 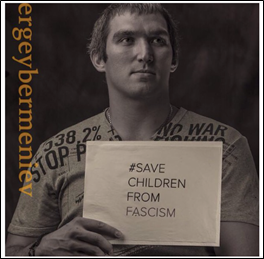 On August 28th, 2014, he instagrammed a professional photo of himself in a t-shirt that read, “No War.” In the photo, he held a sign implicitly supporting Russia’s involvement in the Ukrainian conflict, bearing the hashtag, “#SAVECHILDRENFROMFASCISM.” The post received more than 17.4 thousand “likes,” immediately reaching his nearly two million social media followers and garnering an even larger audience when the story was picked up by local and international media. Two weeks later (sourced from RIA Novosti), the story appeared on the English-language site of Russian internet news outlet Sputnik, which bills itself as a “provider of alternate news content” and is openly financed by the Russian government. Sputnik’s story emphasized the “strong [Western] criticism” Ovechkin received for his photo. Yet despite receiving criticism for his social media activity, Ovechkin continues to post pro-Putin content online, widely propagating the Kremlin’s message and still serving as a useful tool in Russia’s active measure arsenal. Yakunin is but one of Putin’s many siloviki, and the Franco-Russian Dialogue Association one of countless state-sponsored friendship groups and discussion clubs. With innocuous-sounding names, similar groups such as the Valdai Discussion Club and many others remain a highly effective tool for manipulating public opinion and amplifying Kremlin messaging. In support of these active measures, the campaign is constantly reinforced by state-sponsored propaganda, led by RT, which “recently released an hour-long documentary that ‘documents’ illnesses supposedly induced by fracking in the American heartland.”  Similar active measures against fracking are likely to continue, with the Russian Orthodox Church potentially joining the fray and voicing concerns over the environmental impact of hydraulic fracturing. Don’t say, “We need another reset with Russia.” And I’m the guy that said that to the president the last time around in the Oval Office. Toward the end of the Cold War, NSDD 75 and the Reagan Doctrine provided clear, overarching strategic guidance for the whole of American government – a “single sheet of music” to synchronize the US approach to the Soviet Union. Today, no such guiding document exists for American policy toward the Russian Federation. While a nuclear-armed Russia may not pose the same existential threat to the United States that the Soviet Union once did, the current lack of a US strategy for Russia promotes confusion among the agencies and inhibits unity of effort in shaping an American response to Russian aggression. With US policy left up to interpretation by individual actors, and without a cogent, definable end state, a disjointed, ineffective response and wasteful spending are likely outcomes. Additionally, lacking a united front, seams between government branches and agencies present themselves for exploitation. As described in a survey of the power relationship between the EU and Russia, for the EU’s 28 member states defining a common strategy toward Russia is an even greater challenge, and, likely, next to impossible. Despite the lack of a defined US strategy, a number of think tanks and military leaders are discussing new approaches to a future that will increasingly involve the use of “hybrid warfare.” One of these concepts, the so-called “third offset” strategy, envisions a future where “US capability advantages...[in] unmanned operations, extended-range and low observable air operations, undersea warfare, and complex system engineering, integration, and operation … could be leveraged to form a global surveillance and strike (GSS) network.”  The strategy envisages a network of interconnected, autonomous stealth drones, unmanned undersea vehicles, underwater “payload” stockpiles, high-energy lasers, and counter-space capabilities. This strategy is designed to offset the post-Cold War gains of potential adversaries, and allow the US to maintain military superiority well into the future. Proponents of this third-offset acknowledge, however, that it will not be a panacea. This incredibly expensive effort will not address a number of fundamental changes taking place in our increasingly globalized society. Recent Chinese and Russian military doctrines bear out this theory, making it clear that the global information space will be the battlefield of the future – with conflicts won and lost in phase zero of the conflict spectrum. China’s “three warfares” strategy relies on “legal warfare, media warfare, and psychological warfare,” and Russia’s so-called “Gerasimov Doctrine” promotes “the broad use of political, economic, informational, humanitarian and other non-military measures.”  With this in mind, it is extremely likely that use of subversion and active measure campaigns will only increase in the future. It is essential that the US and its allies recognize this threat, and rapidly develop solutions to counter it. In their report, The Menace of Unreality, Peter Pomerantsev and Michael Weiss acknowledge the escalating trend of information weaponization, proposing a number of insightful strategies to combat the effectiveness of coordinated disinformation and propaganda campaigns. Likewise, writing for NATO in a draft report on countering propaganda, reporter Witold Waszczykowski offers a series of suggestions for the Alliance. While Pomerantsev and Weiss acknowledge the contributions of the AMWG, they also understand the limitations of a Cold War approach and methodology in today’s connected world. Despite this, however, the group’s experiences still offer a number of critical lessons and best practices for future government efforts to combat active measures and disinformation. Just as age-old Soviet techniques have been modernized through updated “means,” the lessons of the AMWG can be similarly adapted, leveraging technology for greater collaboration, communication, and responsiveness than ever before. A number of these lessons, along with the recommendations, are reproduced below. Any future effort to expose the active measures of potential adversaries should start with a thorough reading of these outstanding publications, for the first step in exposing an active measures campaign is awareness that the problem exists. Today, that awareness is sorely lacking. Better public awareness campaigns about the use/spread of propaganda, and improved disclosure of personal interests by think tanks, pundits, etc. Targeted online work to assist those affected by intense propaganda: equivalent of online social work for those in heavily impacted areas. Support crowd-sourced investigative efforts to uncover corruption and/or propaganda, with NGO’s as a vector. Establish a “Valdai Alternative” to counter the challenges posed by Valdai, Kremlin-friendly NGOs and the use of the Orthodox Church. Would bring together think tanks, experts and policy makers to help reinvigorate debate about the implications of Russian policy for both regional and global issues. Develop a more coherent narrative and a set of arguments refuting myths cultivated by Moscow, following up on NATO’s Setting the Record Straight example. Encourage grassroots initiatives such as StopFake.org. By publishing their reports and conducting road shows, the group raised awareness, which led to a virtuous cycle of reporting. The more they publicized Soviet disinformation efforts, the more frequent and better reports they received from the field. Remained focused on exposing disinformation (outright lies) rather than propaganda (persuasion). Worked to expose Soviet lies not in an ideological but professional fashion. Helped ensure the group’s efforts were managed with political sensitivity. Political appointees in positions of authority helped provide top cover. Members had no budgets beyond normal travel and public affairs accounts controlled by their bosses. Declassification was contentious however: information sharing did not always occur due to parent agency concerns regarding the exposure of sensitive sources and methods. Among the members of the group, expertise and a mission focused attitude were valued above rank. Steve Abrams is a Russian-speaking US Army Foreign Area Officer specializing in the Eurasian region. He is currently pursuing a Master’s Degree in Conflict Management at the Johns Hopkins School of Advanced International Studies in Washington, DC. E-mail: abrams.steve@gmail.com. Charles Baudelaire, Paris Spleen: Little Poems in Prose, trans. Keith Waldrop (Middletown, CT: Wesleyan University Press, 2009), 60. Arto Pulkki, “Crimea Invaded by High Readiness Forces of the Russian Federation,” Suomen Sotilas, 3 March 2014. Nick Miller, “MH17 Plane Was Shot Down by a Buk Missile, Russian Weapons Manufacturer Says,” The Age, 3 June 2015, available at www.theage.com.au/world/mh17-plane-was-shot-down-by-a-buk-missile-russian-weapons-manufacturer-says-20150602-ghfdco.html (accessed 9 August 2015); Dutch Safety Board, Crash of Malaysia Airlines Flight Mh17 (The Hague: Dutch Safety Board, 2015), 9, available at http://onderzoeksraad.nl/en/onderzoek/2049/investigation-crash-mh17-17-july-2014 (accessed 11 February 2016). David Remnick quoted by Peter Pomerantsev and Michael Weiss, The Menace of Unreality: How the Kremlin Weaponizes Information, Culture and Money (New York, NY: The Institute of Modern Russia, 2014), 14. Michael Birnbaum, “Fearing Russian Expansion, Baltic Nations Step Up Military Exercises,” The Washington Post, 16 May 2015, www.washingtonpost.com/world/ europe/fearing-russian-expansion-baltic-nations-step-up-military-exercises/2015/ 05/15/b5ee51ee-f8c8-11e4-a47c-e56f4db884ed_story.html (accessed 17 May 2015); Ian Johnston, “‘Russia’s Growing Threat: After Ukraine, Fears Grow That Baltic States Could Be Vladimir Putin’s Next Targets,” The Independent, 8 February 2015, http://www.independent.co.uk/news/world/europe/russias-growing-threat-after-ukraine-fears-grow-that-baltic-states-could-be-vladi... (accessed 19 August 2015); Jamie Crawford, “Joint Chiefs Nominee: Russia Greatest Threat to U.S.,” CNN Politics, 10 July 2015, www.cnn.com/ 2015/07/09/politics/joseph-dunford-russia-greatest-threat/index.html (accessed 17 August 2015). “Soviet Active Measures,” YouTube video, 23:31, posted by PublicResourceOrg, 9 December 2010, https://www.youtube.com/watch?v=Z-X_bXL2Tgo (accessed 19 August 2015). “Inside the KGB – An interview with retired KGB Maj. Gen. Oleg Kalugin,” Cold War Experience, CNN, January 1998, http://web.archive.org/web/20070627183623/ and http://www3.cnn.com/SPECIALS/cold.war/episodes/21/interviews/kalugin (accessed 8 July 2015). While some consider Kalugin a controversial figure, where referenced in this document, his quotes comport with a number of other firsthand accounts by KGB defectors; Thomas Boghardt, “Operation INFEKTION: Soviet Bloc Intelligence and Its AIDS Disinformation Campaign,” Studies in Intelligence 53:4 (December 2009), 1–2. Pomerantsev and Weiss, The Menace of Unreality, 8; Matthew Asada, Susan Johnson and Cameron Munter, “Diplomacy Post-9/11: Life in the US Foreign Service,” interview by Kojo Nnamdi,The Kojo Nnamdi Show, 22 September 2011, http://thekojonnamdishow.org/shows/2011-09-22/diplomacy-post-911-life-us-foreign-service (accessed 19 August 2015). The 15,000 figure is referenced by Pomerantsev and Weiss, and the number of post-9/11 diplomats comes from Kojo Nnamdi’s interview. Dennis Kux, “Soviet Active Measures and Disinformation: Overview and Assessment,” Parameters, Journal of the US Army War College 15:4 (Winter 1985), 19. US European Command Communication and Engagement Directorate, “Operation Atlantic Resolve Fact Sheet,” 19 February 2015. “Ukraine Crisis: Russia and Sanctions,” BBC News, 19 December 2014, http://www.bbc.com/news/world-europe-26672800 (accessed 19 August 2015). Bill Gertz, “House Adds Funds to Counter Russian Info War,” Washington Times, 29 April 2015, http://www.washingtontimes.com/news/2015/apr/29/inside-the-ring-house-funding-bill-targets-russian/? (accessed 19 August 2015); “Lithuania to Ban Russian TV Channel for ‘Warmongering,’” Deutsche Welle, 8 April 2015, http://www.dw.com/en/lithuania-to-ban-russian-tv-channel-for-warmongering/a-18370852 (accessed 19 August 2015). Norman A. Bailey, The Strategic Plan That Won the Cold War: National Security Decision Directive 75 (MacLean, VA: The Potomac Foundation, 1998). Richard V. Allen, “The Man Who Won the Cold War,” Hoover Digest, 30 January 2000, http://www.hoover.org/research/man-who-won-cold-war (accessed 6 August 2015). Fletcher Schoen and Christopher J. Lamb, Deception, Disinformation, and Strategic Communications: How One Interagency Group Made a Major Difference (Washington, DC: National Defense University Press, 2012), 3. Ibid. In 1992 the United States Information Agency published what appears to be the final publicly available US Government report on Active Measures, titled “Soviet Active Measures in the ‘Post-Cold War’ Era 1988-1991.” While the report was officially published by USIA and clues to specific authorship are not available, it is almost certain that this document was produced by former AMWG experts as the organization was restructured and disbanded in the wake of the Cold War. “Soviet Active Measures,” YouTube video. Schoen and Lamb, Deception, Disinformation, and Strategic Communications, 8. Quoted in Kux, “Soviet Active Measures and Disinformation,” 19–20. Schoen and Lamb, Deception, Disinformation, and Strategic Communications, 66–67. “The Making of a Neo-KGB State,” The Economist, 23 August 2007, http://www.economist.com/node/9682621 (accessed 11 August 2015); Brian Crozier, “The Other Side of Perestroika: The Hidden Dimension of the Gorbachev Era,” Demokratizatsiya 4:1 (1996), 48–49. The 500,000 figure appears in The Economist, and Crozier describes KGB involvement in drug trafficking. Kux, “Soviet Active Measures and Disinformation,” 19. Boghardt, “Operation INFEKTION: Soviet Bloc,” 3. Carl Schreck, “Russian TV Deserters Divulge Details On Kremlin’s Ukraine ‘Propaganda,’” Radio Free Europe / Radio Liberty, 7 August 2015, www.rferl.org/ content/russian-television-whistleblowers-kremlin-propaganda/27178109.html (accessed 12 August 2015); Pomerantsev and Weiss, The Menace of Unreality. David Remnick, “Watching the Eclipse,” The New Yorker, 11 August 2014, http://www.newyorker.com/magazine/2014/08/11/watching-eclipse (accessed 19 August 2015); “Wikileaks: Russia Branded ‘Mafia State’ in Cables,” BBC News, 2 December 2010, http://www.bbc.com/news/world-us-canada-11893886 (accessed 19 August 2015). Quoted in Anna Nemtsova, “A Chill in the Moscow Air,” Newsweek, 5 February 2006, http://www.newsweek.com/chill-moscow-air-113415 (accessed 19 August 2015). Quoted in “Vladimir Putin: Biography,” Vladimir Putin Personal Website, http://eng.putin.kremlin.ru/bio (accessed 19 August 2015); Masha Gessen, “Portrait of the Young Vladimir Putin,”Newsweek, 2 February 2012, www.newsweek.com/ portrait-young-vladimir-putin-65739 (accessed 11 August 2015). “Russia 2000 Part 2: The Face of Russia to Come,” Stratfor Global Intelligence, 11 October 1999, https://www.stratfor.com/sample/analysis/russia-2000-part-2-face-russia-come (accessed 15 August 2015). Cf. Masha Gessen, The Man Without a Face: The Unlikely Rise of Vladimir Putin (New York: Riverhead, 2012). Boghardt, “Operation INFEKTION: Soviet Bloc,” 1. Andrei Illarionov, “The Siloviki in Charge,” Journal of Democracy 20:2 (April 2009): 70–71. The phrase securocrats appears in Illarionov, “The Siloviki in Charge,” 69; “The Making of a Neo-KGB State” describes their reach. “Russia: Expert Eyes Security Ties Among Siloviki," Radio Free Europe / Radio Liberty, http://www.rferl.org/content/article/1073593.html (accessed 26 July 2015). Jim Nichol, Russian Political, Economic, and Security Issues and US Interests (Congressional Research Service, 2014), 6–7. Security Information Service of the Czech Republic, Annual Report of the Security Information Service (BIS) (2008), 5. Schoen and Lamb, “Deception, Disinformation, and Strategic Communications,” 9. Oleg Kalugin, Spymaster: My Thirty-Two Years in Intelligence and Espionage Against the West (New York, NY: Basic Books, 2009), originally published as The First Directorate (n.p. : St. Martin’s Press, 1994), 54. Schoen and Lamb, “Deception, Disinformation, and Strategic Communications,” 6. “On The Internet, Nobody Knows You’re a Dog,” Wikipedia, https://en.wikipedia.org/ wiki/On_the_Internet,_nobody_knows_you%27re_a_dog (accessed 19 August 2015). Adrian Chen, “The Agency,” The New York Times, 2 June 2015, www.nytimes.com/ 2015/06/07/magazine/the-agency.html (accessed 20 June 2015). “Alexander Ovechkin,” Wikipedia, https://en.wikipedia.org/wiki/Alexander_ Ovechkin (accessed 19 August 2015). https://instagram.com/aleksandrovechkinofficial (accessed 19 August 2015); https://twitter.com/ovi8 (accessed 19 August 2015). “Ovechkin Speaks Against Fascism in Ukraine, Faces Criticism From Americans,” Sputnik News, 10 September 2014, http://sputniknews.com/world/20140910/ 192814040/Ovechkin-Speaks-Against-Fascism-in-Ukraine-Faces-Criticism-From.html (accessed 19 August 2015). Mark Leonard and Nicu Popescu, A Power Audit of EU-Russia Relations (London: European Council on Foreign Relations, 2007). David M. Herszenhorn and Liz Alderman, “Putin Meets With Alexis Tsipras of Greece, Raising Eyebrows in Europe,” The New York Times, 8 April 2015, www.nytimes.com/ 2015/04/09/world/europe/putin-russia-alexis-tsipras-greece-financial-crisis.html (accessed 12 August 2015). Claire Bigg, “Crimea Visit Spotlights Kremlin Sympathies Beyond French Fringes,” Radio Free Europe / Radio Liberty, 29 July 2015, www.rferl.org/content/crimea-visit-spotlights-kremlin-sympathies-beyond-french-fringes/27159124.html (accessed 29 July 2015). Luke Harding, “We Should Beware Russia's Links With Europe’s Right,” The Guardian, 8 December 2014, www.theguardian.com/commentisfree/2014/dec/08/russia-europe-right-putin-front-national-eu (accessed 12 August 2015). Kim Willsher, “Marine Le Pen’s confidence vindicated by Front National election triumph,” The Guardian, last modified 25 May 2014, www.theguardian.com/ world/2014/may/25/marine-le-pen-confidence-proves-vindicated-front-national (accessed 19 August 2015). Amid controversy, in August 2015 Yakunin stepped down as head of Russian Railways to become a senator representing the Kaliningrad region. In October 2015, he announced plans to launch a policy focused global think tank. “Key Macroeconomic Indicators,” Ministry of Economic Development of the Russian Federation, http://www.ved.gov.ru/eng/general/economy/ (accessed 12 August 2015). Anna Andrianova, “Russian GDP Plunges 4.6%,” Bloomberg Business, 10 August 2015, http://www.bloomberg.com/news/articles/2015-08-10/russian-economy-shrinks-4-6-as-oil-slump-risks-deeper-recession (accessed 12 August 2015). Tom Rogan, “Russia’s War on Fracking,” National Review, 3 February 2015, http://www.nationalreview.com/article/397755/russias-war-fracking-tom-rogan (accessed 24 June 2015). Olivier Knox, “Russia ‘Reset’ Architect to Next President: Don’t Try That Again,” Yahoo Politics, 28 May 2015, https://www.yahoo.com/politics/russia-reset-architect-to-next-president-dont-120051660936.html (accessed 9 July 2015). Leonard and Popescu, A Power Audit of EU-Russia. Jonathan Masters, “The Russian Military,” Council on Foreign Relations, 20 March 2015, http://www.cfr.org/russian-federation/russian-military/p33758. “Status of World Nuclear Forces,” Federation of American Scientists (FAS), http://fas.org/issues/nuclear-weapons/status-world-nuclear-forces/ (accessed 17 August 2015); Vladimir Isachenkov, “Russia Is Putting State-of-the-Art Missiles in Its Westernmost Baltic Exclave,” Business Insider, 18 March 2015, www.businessinsider.com/russia-placing-state-of-the-art-missiles-in-kaliningrad-2015-3?op=1 (accessed 17 August 2015). Robert Martinage, Toward a New Offset Strategy: Exploiting U.S. Long-Term Advantages to Restore U.S. Global Power Projection Capability (Center for Strategic and Budgetary Assessments, 2014), ii, v.
 Thomas E. Nissen, The Weaponization of Social Media (Copenhagen, Denmark: Royal Danish Defense College, 2015) 8. Timothy A. Walton, China’s Three Warfares (Herndon, VA: Delex Systems, 2012); Sam Jones, “Ukraine: Russia’s New Art of War,” Financial Times, 28 August 2014, www.ft.com/cms/s/2/ea5e82fa-2e0c-11e4-b760-00144feabdc0.html (accessed 17 August 2015). Witold Waszczykowski, The Battle For The Hearts and Minds: Countering Propaganda Attacks Against the Euro-Atlantic Community (NATO Parliamentary Assembly, Committee on the Civil Dimension of Security, 2015). Pomerantsev and Weiss, The Menace of Unreality, 41.